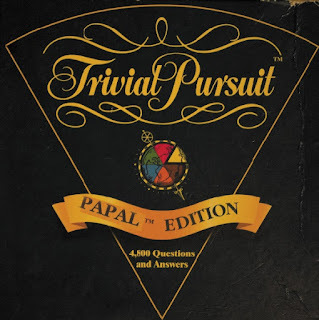 In addition to Eccles's fun Christmas gifts, may I add Trivial Pursuit (Papal Edition, 2016). are answered. It is said that at least four Cardinals - though it could be more in time - wish to play this fun game for the family of God with His Holiness over the season of Christmastide...perhaps beyond! The questions must be answered, but calmly, moving forward in a relaxed manner. Any participant boiling with rage is to be removed from the game for a breather to re-enter the game when he is not boiling with rage. All the questions must be answered in order to get 'all the pies' and 'get home'. Age range of respondents to questions: Between 79 to 80 years old. Number of participants: 7 in private, 5 in public, but could be more. Warning: Despite the limited number of questions, this game can nevertheless take a very long time to complete. Best to leave yourself a year or two to get the answers after many delaying tactics, but that's all part of the fun, eh? No? Limited Edition Price: Legitimacy, but is also of eternal value. Is it true that there is also a new game on the market called 'Pope's Question Time'? It's based on Prime Minister's Question Time and the contestants are allowed to ask four questions. 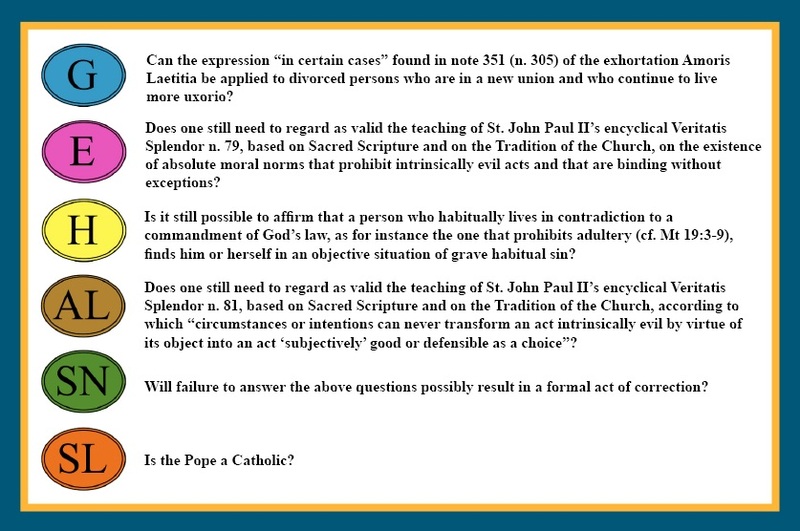 In response, the Pope, like the PM, does his best to respond to the question by attacking the person who asked the question and by providing an answer which is, basically, just gibberish and means nothing but the Pope's supporters, like those of the PM, will clap and loudly cheer. It tends to be a very noisy game but also tends to provide little enlightenment to those who ask the questions. No joke: I own a "Pre-Vatican II" Trivial Pursuit edition. I think very few of them were made. What Part of the Resistance are you? Cardinal Napier: Let Conscience Reign Supreme! The Next Great Papal PR Move?